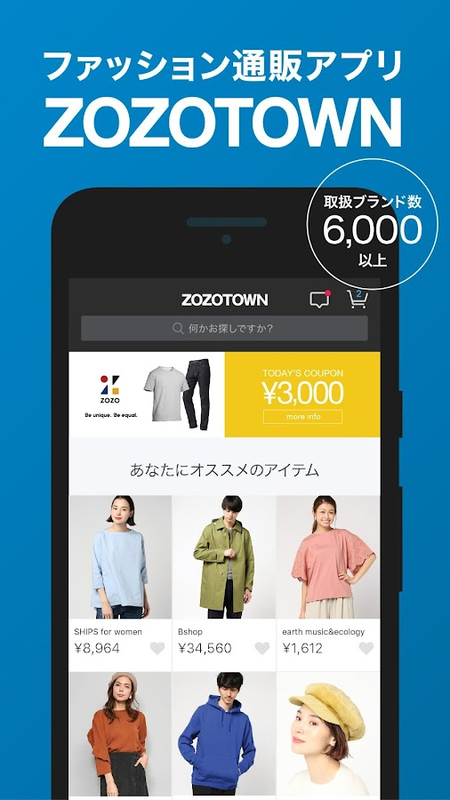 ZOZOTOWN (zozo.jp) is the largest online fashion store in Japan!Browse and find the items in a fun way; just like how you flipthrough a fashion magazine! You can shop more than 520,000 itemsfrom 3,900 brands including United Arrows and Beams. Enjoy shoppingin ZOZOTOWN ,whenever, wherever! ●Features - Favorites Add items orbrands to your favorite for a quick access to them. - Search Searchitems by brand, category, price range, and other criteria. -History Use Search history for quick access to the items. Vieweditems helps your shopping easily. - Push Notification Inform youwhen new items in your favorite brands come in. With this free app, you'll have the entire world of Esprit with youall the time. Never miss out on any offers again! Whether you're athome or on the go – with the Esprit app it's easy to discoverEsprit from your smartphone, including our many customer serviceoptions: + Discover the new collections and fashion trends beforeanyone else + Exclusive offers & promotions + You'll always beup-to-date on current VIP events, coupons, vouchers, offers &much more + The Storefinder will show you all of the Esprit storesnear you + Simple & secure shopping in our e-shop with thebiggest Esprit collection in the world* Download the new Esprit appfree of charge now and discover the world of Esprit on yoursmartphone. *The e-shop is currently available in these countries:Australia, Austria, Belgium, Bulgaria, China, Czech Republic,Denmark, Estonia, Finland, France, Germany, Greece, Hong Kong,Hungary, Ireland, Italy, Latvia, Lithuania, Luxembourg, Malaysia,Malta, Netherlands, New Zealand, Poland, Portugal, Romania,Singapore, Slovakia, Slovenia, Spain, Sweden, Switzerland, TaiwanR.O.C., United Kingdom About Esprit: Esprit is a leadinginternational fashion brand. Its inspiring collections for women,men and kids invite you to shop. As well as sustainable fashion andlong-lasting shoes, we also offer a large selection ofco-ordinating accessories, lifestyle products and sportswear. AtEsprit we believe fashion should be simple and carefree, which iswhy we are delighted to be able to offer you this unique shoppingexperience. Do you have any questions about the Esprit app? Orideas about how we can make it even better? E-mail us with yourfeedback at [email protected] We are looking forward to hearingyour feedback so that we can make the Esprit app even better foryou!